Would you want to walk into a gun fight only able to shoot at things behind you? Neither do Osprey pilots. That's why the DoD is outfitting the V-22 tilt-rotor fleet with some new, forward-firing rockets. The V-22 Osprey—the tilt-rotor aircraft the POTUS isn't allowed to ride in—has largely been limited to shuffling troops and equipment around battlefields as the planes are only equipped with a single, rear-facing .50-cal machine gun set up in the cargo bay. Occasionally they'll also be outfitted with a 360-degree R/C belly gun (the Interim Defense Weapon System) that can be controlled from the cabin, but that thing is so damn heavy that crews can only tote a fraction of the cargo they would be able to otherwise. As such, the Osprey currently has to rely on armed escorts during operations, a practice that has a whole host of other issues—like the fact that the Osprey can fly farther between refueling than the attack choppers that are accompanying it. 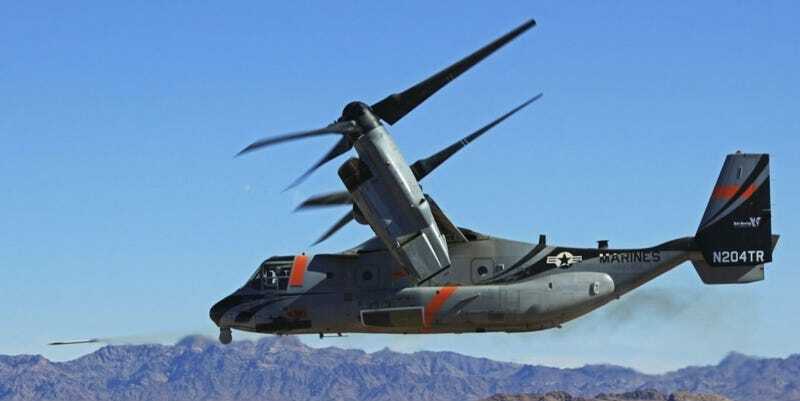 What would be a non-stop flight for the Osprey were it flying solo suddenly becomes a two or three layover affair at forward arming and refueling points so the accompanying helicopters can re-up. That won't be the case for long. During a series of tests at the U.S. Army Proving Ground in Yuma, AZ, last month, Bell Boeing pilots successfully launched a number of different rocket types—including the BAE APKWS and the Raytheon Griffin B—from pylons located under the left cockpit window. This is actually a pretty slick placement as it keeps the rockets and their exhaust blast out of the way of the rotors while allowing the crew to pick targets through the cockpit windows with their own eyes, rather than using a remote monitor and sight as with the R/C belly gun.